I loved my 2016 wedding season so much! I not only love the couples that I got to work with, but I also love that I had so many opportunities to shoot at new-to-me wedding venues throughout Michigan! I believe your wedding should be a true reflection of your unique love story, and I think my 2016 weddings were so unique and amazing because every detail my couples thought of was personal to them! One cool thing about the state of Michigan is that there is virtually every landscape you could ever want as a backdrop for your wedding; urban cities, historic mansions, wide open countryside, picturesque vineyards, secluded lakes, evergreen forests, snow covered hills, vibrant fall colors, and hometown churches. Photographing new venues is a guaranteed way for me to stay fresh and creative as a wedding photographer because it's like a fresh canvas for me! Now don't get me wrong. . . I LOVE shooting at my favorite venues again and again because I know all the picturesque spots, but every now and then, it's fun to have something new and to have the chance to try out my creativity in a new place! 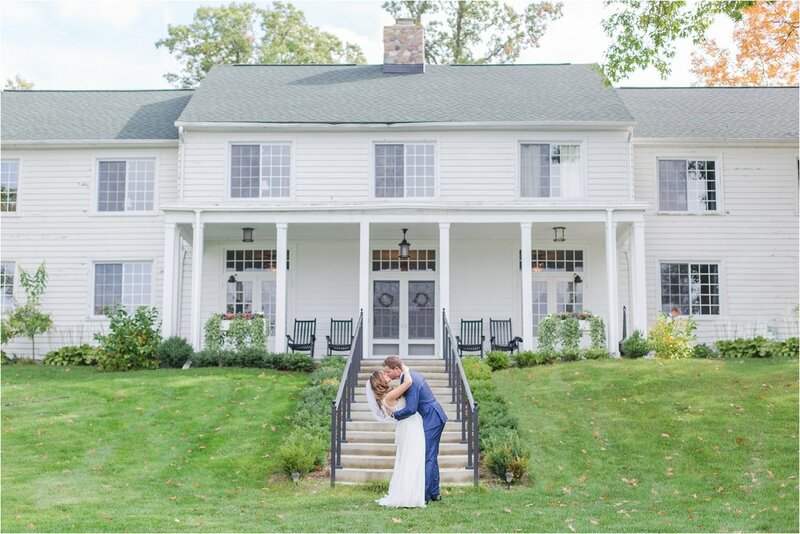 I feel like brides have so many options when it comes to picking a Michigan wedding venue, so I thought I would highlight some of my FAVORITE new-to-me venues from 2016 and maybe give brides or one-day-to-be brides (a.k.a. those of you like me!) some venue inspiration! Because I don't know about you, but I love to imagine how my wedding day would be in different places - even if Hawaiian wedding isn't a reality at this point, a girl can dream! Here is a list of all the new venues that I photographed for the first time in 2016 and that either impressed me, treated myself and my assistant well, have gorgeous portrait locations, and/or they just work well overall for weddings! I hope you enjoy some images from these amazing venues! See Alana + Kyle's full wedding day by CLICKING HERE! See Anna + Michael's full wedding day by CLICKING HERE! See Molly + Chris' full wedding day by CLICKING HERE! See Ericka + Mike's full wedding day by CLICKING HERE! See Melissa + Jeremy's full wedding day by CLICKING HERE! See Maegan + Eric's full wedding day by CLICKING HERE! See Tina + Zach's full wedding day by CLICKING HERE! See Lindsay + Corbin's full wedding day by CLICKING HERE! View all of my favorite 2016 Wedding images by CLICKING HERE! Did you enjoy something about this post?! Did something about this story speak to you? I'd love to hear your thoughts and read your comments below! I want to thank you all so much for participating in my community and joining in on the online conversation. If you would like to share what you've read, please use the share button below!